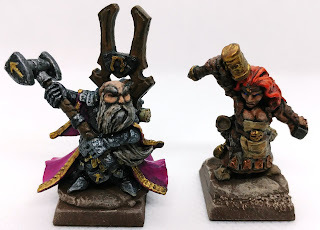 For the upcoming Frostgrave campaign, I started to dabble in 28 mm fantasy miniatures again. 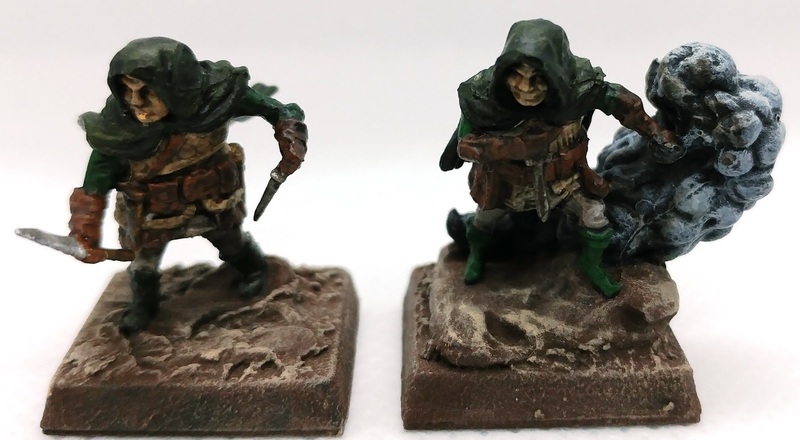 By far, the easiest (on the wallet) option is Reaper Bones these days, although the D&D unpainted line of miniatures is also giving them a run for the money. My miniatures are mostly a mix of these two product lines. 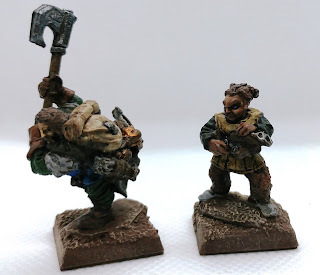 For my Frostgrave warband, I decided on a dwarf-themed group, with a core of dwarves along with other hired "helpers". My wizard is an enchanter, along with his rather buxom apprentice. Both of these are Reaper Bones miniatures. In Frostgrave, the enchanter can create constructs, obedient machines animated using magic. In this case, I have small, medium, and large constructs that are supposed to be rock-like creatures. The small and large constructs in the foreground are from the World of Warcraft boardgame, while the medium construct is Reaper Bones. 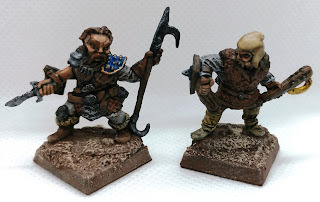 For some shootiness, I have a couple of crossbowmen. One of them is a dwarf ranger figure, and the other is a derro (i.e. "dark dwarf"). Both are Reaper Bones again. 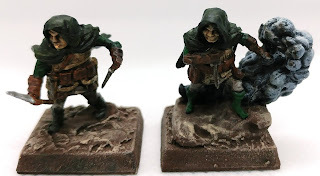 For cannon-fodder, I mean, more valuable members of the group, here are two more Reaper Bones derros used as thugs. For sneaking around, these are a couple of halfing thieves. These are D&D unpainted miniatures, which are much slimmer in build compared to Reaper. Some more extra characters. In this case, they can fill in as a man-at-arms, a templar, and a treasure hunter, respectively, as needed. All of these are again Reaper Bones. 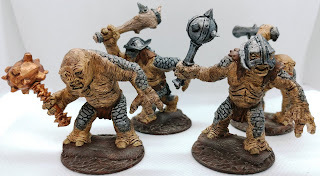 For both Frostgrave and other fantasy games, I also painted up some trolls, in case they are needed. 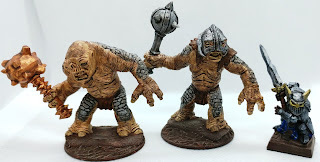 These are actually 1/72 scale fantasy figures, but they are big enough that they can pass as 28 mm trolls. 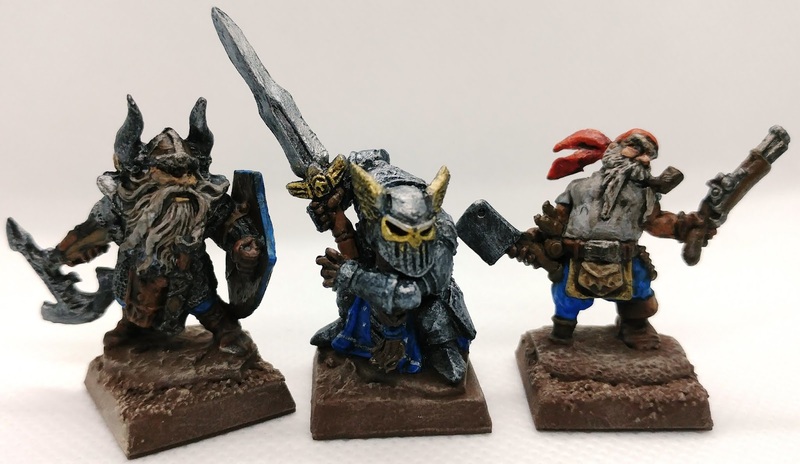 Here is a size comparison with a 28 mm figure. These 1/72 trolls are still big enough to be a threat to a human-sized 28 mm figure. 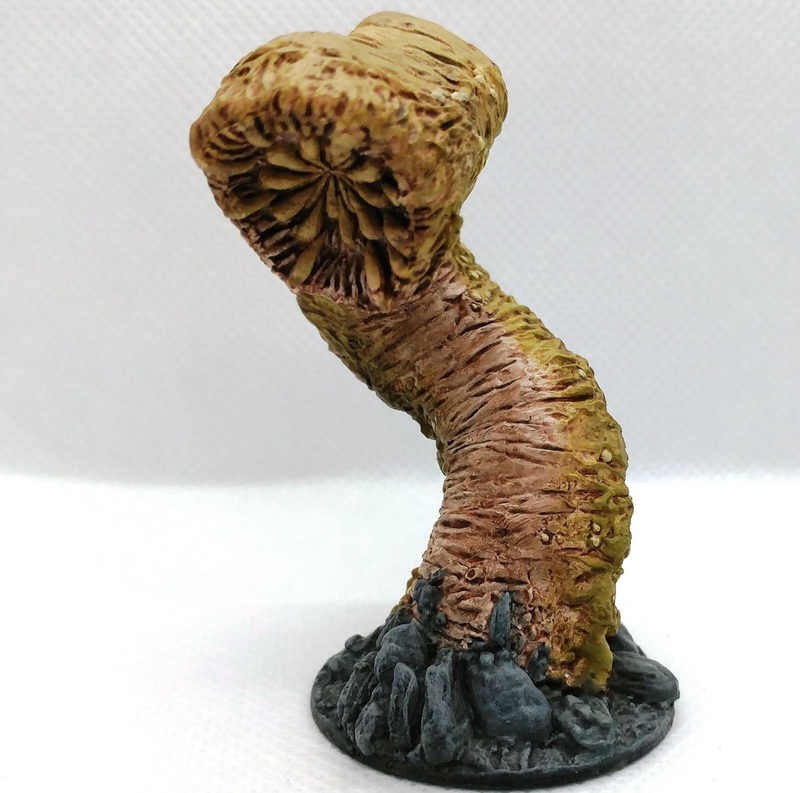 I also painted up a Reaper giant worm, just because I like the model. This is a gorgeous piece of sculpting to paint. The first Frostgrave game is coming up right away on Sunday, and I can't wait.